I was just looking at the Boston Lost & Found pics that we uncovered of him mid-course. He definitely has something in his pants pocket -- personally I would guess that it's a cell phone... although I suppose that it could also be a Clif Bar. I'm really not sure why a cell phone would even be necessary for him to carry? NO 2:52 guy would be carrying a cell phone. The BAA needs to be notified and he needs to be DQ'd. In light of all the evidence that has been compiled by the LetsRun community, it seems to me that this is way too elaborate to simply be cheating in races / making up fake races. Am I the only one who thinks that NOBODY, regardless of the size of their ego would go to these lengths simply to run a few sub 3 marathons. To me, there is money involved. I'm ont exactly sure how, but all of this would be worth the trouble if one were profiting from it. At the very LEAST there had to be some skimming going on with the donations. I wouldn't be suprised if in the end it comes to light that this had very little to do with running at all, and much more to do with fraud. Running was just the front used to funnel the cashflow. As I said, I just find it very hard to believe that someone would travel around the United States with a sem-elaborate cheating routine simply to make their ego bigger...I'm guessing someones pocketbook is what was getting bigger. I think the noses are the same, just flared out in the picture where the nose appears larger. I'm very intrigued by this theory. There is certainly no fame attached to running sub-3 in every state. Two people have done it. Can you name them? Seems unlikely that it would just be a personal goal. If it was just a personal goal, then why cheat, and why self promote? I think you're right. He's either making money or it's just some sick mental disorder addiction thing. I'm not certain we'll ever fully understand his motivation, or how he was able to cut these courses. I've enjoyed reading these posts, and have been incredibly impressed with the detail and thoroughness of the picture hunting. Good work. If anything positive is to come out of this, it would be that his Boston time from 2010 is declared void, he is disqualified, and more importantly, banned from any and all future BAA events. They need to come down hard on this guy, and I hope someone from their office has been notified and is looking into this further. 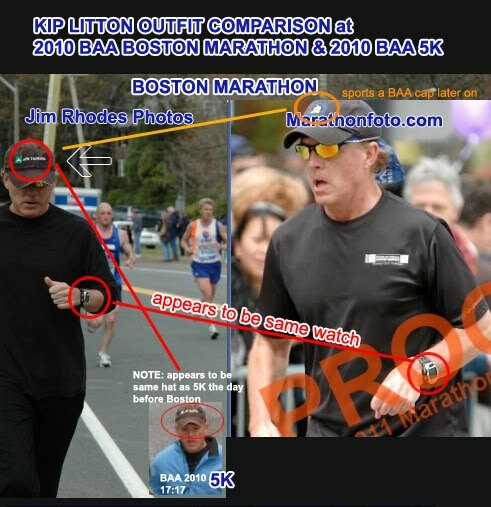 I think it would be good to list what what outfit kip was wearing at each point at Boston. That way we can narrow down when he made the change in clothes. I disagree, when he is in shorts his left hand is in a fist. Pants... lefts hand thumb up. Why yes, yes I can name them. Joe Bowman, and Toby Skinner. The only reason I know this is I am currently running all 50 states (initially trying for sub 3, now trying for sub 3:10's due to weekend doubles), so I have researched this before. I suspect Chuck Engle will be joining this club soon. Back to the topic at hand...I absolutely agree GK, running sub 3 doesnt really deliver any fame/fanfare. As you stated, its either that KL has some type of infatuation/mental disorder about this, or (what I believe) he was profiting from this sceme. The fact that donations were being lead directly to his own website makes this even more plausable. I have to admit, cheating at marathons is a rather exhaustive way of cheating people out of a few bucks...but, it is also one that most would never suspect. "According to the ADA there are over 167,769 dentists in private practice earning an average net salary just over $178,000 per year as of 2009." rather than go to races and pretend you're racing? top photo on the right, especially. Carrying something in his left hand. Cell phone with antenna sticking out makes the most sense. I was thinking he was acting without an accomplice before this, but this suggests otherwise. Skimming donations is pretty dumb and very easy to catch. The guy is a doctor, which means he could make much more $ bilking medicare/medicaid or even regular insurance companies. I suspect that the plan was to run a ton of sub 3 marathons, raise money for CF, write a book and then tour around doing motiviational speaches. If done right, that kind of thing could bring in pretty big bucks and would feed the need for attention. One other point as to jumping on and off the course in Boston. 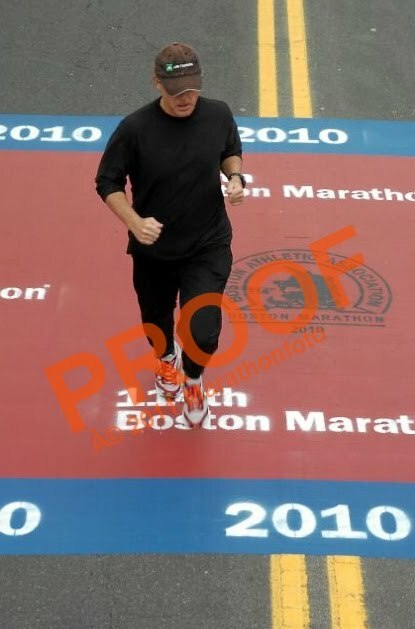 When I ran Boston, I had a bad case of the poops from mi 9-16. I repeatedly ran off the course and went back behind buildings for emergency relief. Each time I came back on the course, it looked like I came from a parking lot way off the course. No one said anything--neither runners nor spectators. Also, Boston is always a heavily bandited race. It is not unusual to see people without numbers. It is an easy race to cheat. Can we dismiss that he may have a family member with Cystic Fibrosis that he's trying to raise money for as a possible source of motivation. It seems like if that were the case they'd mention it in that one article. It wouldn't constitute cheating, but I would feel like a bit of a d-bag if that were the case. Or, those could be his keys. If he is carrying a cell phone at Boston, that's further evidence that he didn't just discard his pants for his outfit change -- but rather just stashed them in his car. Of course the cap change already confirms the car. The only other possible explanation for his cap change could be that his wife or a friend was waiting along the course after 30K to give him the all-important fresh cap. Yeah right. I was wondering about that too. For some reason I thought his kid had cancer. I think the detective got it right. Take a look at the picture ending in -013. That looks like it's something cylindrical that's sticking out of the top of whatever Kip's holding in his palm. A phone seems like a pretty good guess. Found this while digging around...kinda ironic. A race in Kips town. If he ran, it would take the race name to a whole new level.